We have been having some major internet and phone issues all day today. Everything will work fine for a bit and then all of sudden I have no dial tone, no internet connection and the cable goes in and out. This is especially frustrating when trying to do blog posts. I will get logged in ready to go and then I can’t load any pictures or add links to the post. Even auto save doesn’t work. So I end up with half written posts sitting open until I get a connection again and can at least save it. I have been hoping this would work itself out or Comcast would figure out the problem and fix it. I also realized that I may get more done if I had office desks and office furniture. While I love the portability of my laptop, I hate that I don’t have an actual desk or even a office space. 9 times out of 10 I am sitting on the couch with my laptop on my lap trying to get something up quickly. The other time I am at the kitchen table. And because our table is for everything but eating at, I know I am not the only one, I am surrounded by clutter. The mail that needs to be sorted, my husbands lunch box, car keys, my sewing machine. So today I daydreamed about what my perfect office space would look like. I am loving the look of this Bush Office Furniture. I could actually get away with an office space with something like this corner desk. Which happens to be ideal because I don’t have a spare room I could devote. I am a fan of darker wood and matching furniture. So the entire Bush furniture line is perfect. 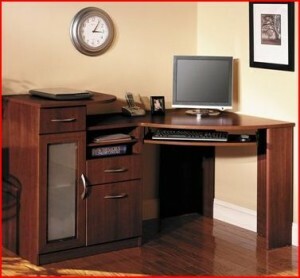 Do you have a home office or office space? Or are you like me and stuck on the couch?